Home > Free > $500 Cash Instagram Giveaway from Cents of Style!!! $500 Cash Instagram Giveaway from Cents of Style!!! Are you following Southern Savers on Instagram?? If you’re not then let me introduce you to a fresh new giveaway we just posted about! 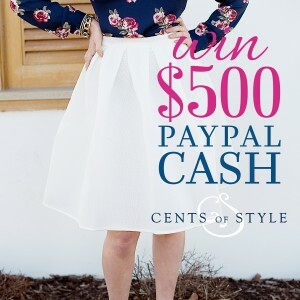 I’ve teamed up with 10 other blogs and shops for a $500 PayPal cash giveaway from Cents of Style. Head over to my Instagram page to see how to enter. You can enter the giveaway on Instagram until tonight 2/17 at midnight. The winner is going to be randomly selected and announced in the comments of the post over on the Southern Savers Instagram page. This is an Instagram giveaway. If you don’t have an Instagram account, we’ll have plenty of other giveaways for you to enter coming up in the future.